An overview of TSX- and TSXV-listed graphite companies with market caps above $15 million. Demand for lithium-ion batteries continues to rise, and the need for graphite is increasing in tandem. Graphite is a key component of these batteries, and many market watchers believe companies that are mining and exploring for it may be poised to do well in the coming years. With that in mind, it’s worth being aware of which graphite companies are out there and what they are currently doing. To help investors with that task, we’ve put together a two-part list of graphite companies trading on the TSX and the TSXV. Below we profile graphite companies that are listed on those exchanges and that had a market cap of more than $15 million as of February 10, 2017. Click here to see the second part of the list, which features TSX- and TSXV-listed graphite companies with market caps of less than $15 million as of that date. Please let us know in the comments if we’ve missed a company! Alabama Graphite is a flake graphite exploration and development company, as well as an aspiring battery materials production and technology company. It is focused on its flagship Coosa graphite project, which it says is the most advanced flake graphite project in the contiguous US. It is also moving forward at its Bama mine project. Both projects are located in Alabama. Canada Carbon is a graphite-focused exploration company with three strategic properties in Quebec. The company is currently focused on its Miller project, which holds a rare form of hydrothermal lump-vein graphite. At the end of 2016, Canada Carbon released an updated resource estimate for Miller. The updated resource estimate includes an indicated resource of 2.65 million tonnes with an average grade of 0.8 percent graphite, and an inferred resource of 7.56 million tonnes with an average grade of 0.77 percent graphite, within the boundaries of an optimized open-pit mine model. According to the release, “[t]he new pit constrained graphite resources have increased by 379%” compared to Miller’s April 2016 preliminary economic assessment (PEA). Elcora was founded in 2011 and bills itself as a vertically integrated graphite and graphene company that mines, processes and refines graphite, targeting high-end markets for the metal. As part of its vertical integration strategy, Elcora has secured high-grade graphite and graphene precursor graphite from its interest in the Ragedara mine in Sri Lanka, which is already in production. Over the last few months, Elcora has worked on developing processes and equipment to produce high-quality anode powder for lithium-ion battery anodes. In January, the company announced positive results of lithium-ion battery tests using its graphite powder. Energizer Resources is a mineral exploration and mine development company focused on the development of its Molo graphite project in southern Madagascar. The Molo project is one of the world’s most advanced, full feasibility-stage graphite projects and is on track for production in Q4 2018. In November, the company outlined a phased development plan for Molo based on the results of a front-end engineering and design study. Focus Graphite is an advanced exploration and development company with the goal of becoming a low-cost producer of technology-grade graphite concentrate at its Lac Knife and Lac Tétépisca projects in Quebec. Most recently, the company announced that initial locked-cycle flotation tests on Lac Tétépisca mineralization achieved overall graphite recovery of 92.7 percent total carbon, as well as concentrate grades of 96.2 percent total carbon for all flake sizes combined. 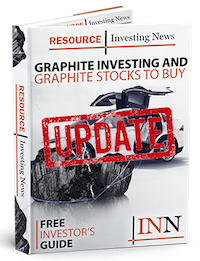 Graphite One Resources is exploring, with the intent to develop, its Graphite Creek deposit on the Seward Peninsula in Alaska. The project is currently advancing from the exploration to the evaluation phase. In January, the company released the results of an inaugural PEA for its Graphite One manufacturing project, which is conceived as a vertically integrated manufacturer of high-grade coated spherical graphite with mining and processing facilities. The PEA projects a net present value of $1.037 billion using a 10-percent discount rate, and an internal rate of return of 27 percent. Annual production of coated spherical graphite and other graphite specialty materials is projected at 55,350 metric tonnes when full production is reached in the sixth year. Scandinavia-focused Leading Edge Materials, formerly Flinders Resources, acquired Tasman Metals in August 2016 and now holds the Woxna graphite facility as well as the Norra Karr rare earths project, among others. The Woxna graphite facility, which is currently permitted to feed 100,000 tonnes of graphitic rock per year, operated in 2014 and 2015, and is now maintained on a production-ready basis. Most recently, the company released the latest results from optimization and qualification test work to produce high-value graphite products from the Woxna graphite facility. In the last few months, Leading Edge has also staked its first cobalt-copper project and submitted a drill permit application for its Bergby lithium project. Mason Graphite is focused on its Lac Gueret graphite project in Quebec, and is looking to obtain all permits required to begin construction. It anticipates starting production in 2017. In November 2016, Mason Graphite provided details on the progress of its detailed study on the large-scale production of value-added graphite products. The study was initiated in 2015, and President and CEO Benoit Gascon said the company is encouraged with how it is moving along so far. “The value-added market as a whole, not only battery materials, has the potential to markedly improve the economics of an already very compelling project,” he said. Northern Graphite owns the Bissett Creek graphite deposit, located in eastern Ontario. Bissett Creek is an advanced-stage project with a bankable final feasibility study and its major environmental permit. In October 2016, Northern announced that the spherical graphite test facility that it acquired along with a group of other companies has begun operations. In 2015, Nouveau Monde discovered a graphite deposit on its Tony claim block, which is part of its Matawinie graphite property in Quebec. In June 2016, the company released a PEA for the west zone of the Tony claim block; it shows that the zone should produce 50,000 tonnes per year of high-purity flake graphite over a period of 25.7 years. This year, the company plans to continue advancing the zone to the feasibility stage. Editorial Disclosure: Canada Carbon, Focus Graphite, Graphite One, Energizer Resources and Leading Edge Materials are clients of the Investing News Network. This article is not paid-for content. Has any graphite exploration company advanced beyond feasibiity studies and actually producing and selling graphite?